ON NWU1 NAVY BLUE DIGITAL FABRIC 3.5"x2"
Infrared Magic Black Solas lettering on NWU1 fabric with Velcro backing. 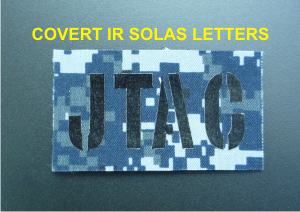 Covert IR Solas letters, will not reflect in the visible spectrum. Lettering Reflects brightly when viewed with night vision equipment. 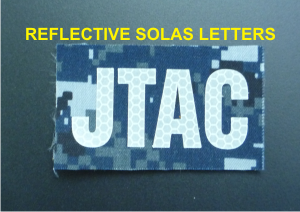 Reflective Solas letters, will reflect in the visible spectrum. Lettering reflects brightly when viewed with night vision equipment. Pricing is for Magic Black Solas lettering on NWU1 fabric. Select your patch prefferences and type the quantity in the box.